In December, my boyfriend and I went to London. Boyfriend was on a work trip and we stayed at Eccleston Square Hotel, a swanky establishment in close proximity to Victoria Station. Our exorbitantly priced boutique hotel room was like being stuck in a poorly designed iPad app: slick looking with a plethora of gadgets that did not work consistently or at all. Sometimes the light switches turned on the bathroom lights, sometimes they turned on the towel warmer, and sometimes I couldn't figure out if our door was locked or not. The bed was completely adjustable and vibrated, which was relaxing after a day of sightseeing or in the case of boyfriend, working. The continental breakfast provided by the hotel was delicious: a selection of cheeses, soft-boiled eggs, croissants (butter or chocolate), cereal, yogurt pots with fresh fruit, and other breads for making toast. Plus coffee or tea or juice. The coffee was fantastic. In fact, I would say that coffee was one of the best damn things about London: not a drip brew in sight, all espresso. Oh, and the elevators are extremely closed in and have about twenty television sets. Enough about our Big Brother hotel. 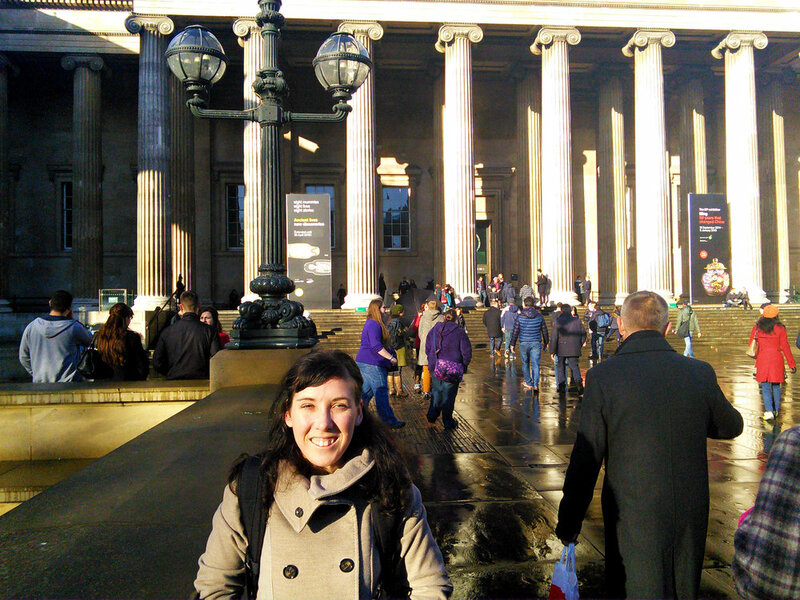 I want to talk about my absolute favorite place in London: the British Museum. I have many mixed feelings about the British Museum, and museums in general: awe at the history, panic at the number of people and exhibits, and guilt, angry guilt mixed with overwhelming passion for all things old. I went three separate times on my week long trip and I want to go back again. A junkie, wanting to relive the first overwhelming awe of staring at thousands of years of history in the face. Let me get back to the guilt. 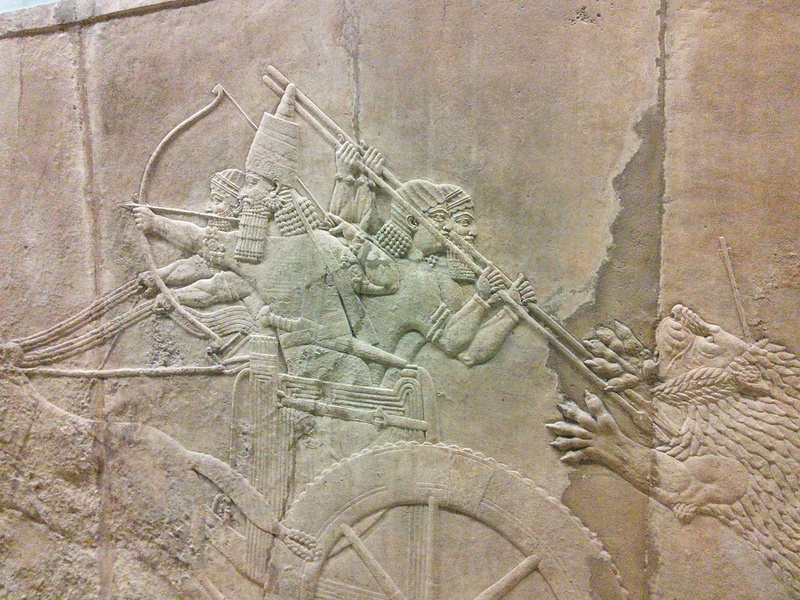 The British Museum is an ode to British Imperialism and Colonialism. It screams: look at all the places we conquered and subsequently stole from. Cultures reduced to reproductions of architecture, post-it note summaries, and exhibits to be gawked at by thousands of tourists. Cultural voyeurism. At times I felt like I should be wearing a pith helmet and bringing out my smelling salts. In front of the British Museum. White, western guilt aside, I loved the British Museum. A free museum, it is very crowded especially during the holiday season and on a Sunday. It was filled with tourists from all over Europe, particularly Russians, Italians, and Spaniards. While English culture is not far removed from my own American (particularly Californian) culture, my experience as a tourist in Europe was a lesson in cultural differences regarding personal space and public niceties. A few things I encountered in the British Museum and London in general: people get very close to you, such as almost on you; people do not hold open doors and if you hold the door open for them they do not thank you or acknowledge you; and people never seem to say excuse me if they ram into you, cut in front of you, or open a door into your face (all things which happened to me). I suppose one could argue this is big city behavior, but this is not what I experienced in Vancouver, New York City, or Edinburgh. Just London. I could tell you about everything that I saw in the Museum, but you could get that from a guide book. And really it's worth more to see it yourself. These were my favorite parts of the museum. I apologize for the poor photo quality; I took these with an unfamiliar tablet camera app. Akhadians: All things cuneiform and beards! Façade replica of the Nereid Monument in Turkey. The Monument of the Nereids: No wonder Cassiopeia said Andromeda was more beautiful. They don't even have heads. Cuneiform Tablets: Tablets about how to read a tablet. I took this photo on a tablet. This cup: "East India Sugar: Not Made By Slaves"
I also loved the Ghana coffin, African textiles, and Buddhist statuary exhibits. The Japanese history exhibit was also greatly enjoyable. But seriously, how can you beat a tablet that's about how to read other tablets? Did I mention I went here three different times during a week trip?